The Excavation of Dutch Gap, 14" x 18" (paper size); 25.25" x 29.25" (framed); pen & ink drawing; signed in image lower left: “ARW”; inscribed lower right, “The Excavation of Dutch Gap”; Illustrated: Johnson, Robert Underwood, ed. BATTLES AND LEADERS OF THE CIVIL WAR, Grant-Lee Edition, 1884, 1887, 1888, Volume IV, Part II, New York: The Century Company, p.575. The Civil War's most prolific sketch artist, Alfred Waud was born in London in October 1828 and received his early training at the Government School of Design at Somerset House. Waud emigrated to the United States in 1850, working as an illustrator for various books and periodicals. In 1860 he was hired as a staff artist by the New York Illustrated News and, in 1861, was assigned to – or "embedded in" as we might say today – the Army of the Potomac. He covered Union action in the Shenandoah Valley and was on the field at First Bull Run (First Manassas). Although he later migrated to Harpers Weekly, he continued to follow the Army of the Potomac, sketching every major engagement from First Bull Run to the Siege of Petersburg. He was present at Gettysburg and rendered the only eye-witness sketch of Pickett's charge. Waud died in Marietta, Georgia in April, 1891. Dutch Gap was a narrow strip of land between two sections of the James River. 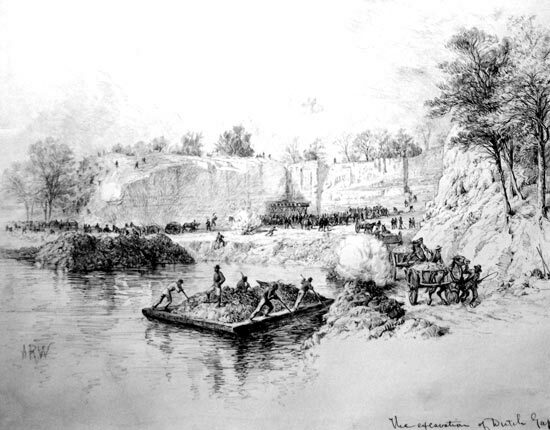 The construction of a canal would supposedly enable Union ships access to the city of Richmond without passing the city's Confederate defenses further down river. The men of the 6th Colored Infantry were among those assigned the physically demanding labor required to complete this project. According to Ulysses Grant, the African-American troops "displayed the greatest courage and fortitude, and maintained under the most trying circumstances their usual good humor and cheerful dispositions." (Excerpt from Lt-General U.S. Grant's Report, dated July 22, 1865). Excavating The Dutch Gap Canal is the drawing the artist later created from a field sketch he made at the time the work was being done.